Monumentality and New Techniques in Sculpture. Since mid 20th century Architecture has experience great change. In one hand, the increasing interest in urban planning not only involves the construction of the building themselves, but it also asked for its inclusion in an area and in consonance with deep studies of their physical, social and economic impact. On the other hand, the development of new and revolutionary materials has made possible the creation of some buildings that in a recent past would have been unthinkable. It combines the imagination of the architects and engineers with the aesthetic impact of materials such as reinforced concrete. Structural solutions are revolutionary and, in addition to use industrial materials they created sophisticates spaces through the distribution of light and the use of materials not frequent in architecture, underlining their tactile qualities. The pioneer of this architecture would be Alvar Aalto. Other architects working in this way are Eero Saarinen, Nervi, Utzon or Kahn. Their sign of identity is the use of industrial material to solve difficult structural problems. This style has its roots in the works of the Bauhaus and it developed in the US thanks to the influence of Mies van der Rohe and his disciples. This style is well suited to large metropolitan apartment and office towers. These building proved to have a commercial potential and were extremely efficient for large-scale construction in which the module could be repeated indefinitely. Inner spaces became standardized, predictable, and profitable and exterior reflected the monotony of the interiors. The blank glass box became ubiquitous. Even when these buildings are considered examples of an austere classicism, they are also considered coldly impersonal. 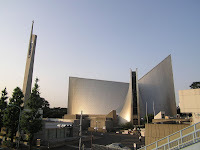 Architects working in this style are Stirling, Kenzo Tange, or Philip Johnson. Between about 1965 and 1980 architects and critics began to espouse tendencies resulting in a style that is not cohesive but that has a distinct set of principles. Postmodernists value individuality, intimacy, complexity and occasionally even humour. Some architects, such as Venturi, defended an architecture that can produce any kind of buildings, being them equally filling stations or fast-food restaurants. Some works have references to old style and can use vivid colours. Other architects of this movement are Graves, Meier, Jahn or Moore. The High-Tech style came to prominence in the 1970s and 1980s through the work of the architects Richard Rogers, Renzo Piano and Norman Foster. Its origins lie in the 19th century when new industrial techniques and materials, previously used on engineering projects such as bridges, began to be applied to architecture. High-Tech buildings are typically constructed of steel and glass, make innovative use of technology and are often likened in appearance to the machines because of the tendency to draw attention to, rather than conceal, structural and functional elements. 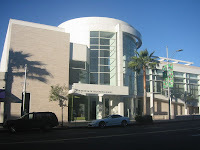 Postmodernism is not the major strand in the most recent avant-garde architecture. An entirely different approach is represented by the style or idiom known as High-Tech, in which expressive use is made of the constructional and operational aspects of a building, with features such as supporting members or heating pipes fully exposed to view. Deconstructivism is the term used to characterize buildings in which elements such as fractured forms or warped planes undermine conventional notions of stability and harmony. 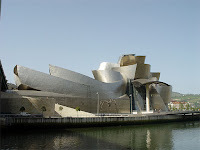 The works of Frank Gehry or Zaha Hadid can be considered good examples of this style.